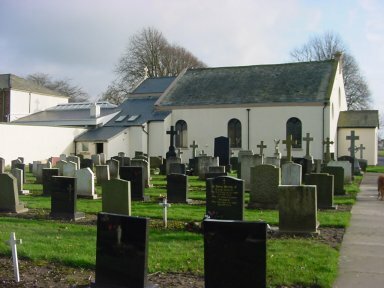 All the earlier known marriages, baptisms and burials in the Billington family took place in this parish church during 'penal times' when the country was still in turmoil with the events of the Reformation and Catholics were unable to practise their religion openly. This branch of the Billington family is believed to have remained Catholic throughout while outwardly conforming as they had no alternative. The children recorded without a baptismal date have not been verified. The IGI has now reorganised its records and largely abandoned the Batch numbers. As they now include data from submitted family trees early records in particular, as in generations 1-4 below in particular whould be treated with great caution. Even when re-checked, the data below cannot be guaranteed. A typical example is given in the 3rd generation. Two dates have been given here for the birth of William as there were two Williams born with father John but with different mothers. Marie Haighton appears to be the mother of William born 1683; no mother's name is given in 1688 and a Wiliam born in 1689 (as given here originally) was the son of Thomas.As the early records do not usually state the mother's name it can't be assumed that these are correct. All the vital records will need to be checked from the mf! The same also applies of course to burials which can be even less reliable with no other person mentioned to corroborate them! Ellen appears on the Return of Papists of 1767 as wife to Edward. She is listed on several IGI records (not from any obvious church source) as from Ashton aged 50, her surname being 'Emon'. They look as if they have been copied from just one one source and there is no further evidence to say what this was. She could not have been baptised as a Catholic at St Andrew's in Ashton as it was CofE, and of a later date, with no records before 1837. This must be a confusion with Cottam which perhaps came from the censuses later lumping Ashton, Lea and Cottam together as if they formed a unit. Unfortunately there are no Catholic records earlier than about 1776 for Lea, 1783 for Cottam, 1764 for Westby or 1774 for Newhouse to corroborate these details. It is unlikely that Edward and Ellen could be baptised, like their children, anywhere other than in the parish church. the family being: Edward 52, Ellen 50, Ellen 18, Margaret 12, James 10, William 8, John 6. It looks as though Alice died before 1767 or was already married and/or living elsewhere. Ellen should have been 13, so it looks as if the 3 was mis-read as an 8, or else there was another of that name. If she was 18 she would have been born in 1748/9 but no such record has been found so it could just be a simple mistake. However, Margaret and William are recorded as being 'Protestants' at the baptisms of their children. Notes: sps is an abbreviation for 'sponsores', i.e. godparents. The spellings here are as recorded by the CRS. Hellen is probably Ellen and there are a variety of spellings of Hathornwite - Hawthornwaite, Hathornwaite, Haythornthwaite etc At this period spellings were not important - variations may even appear in the same record! Peter Rushton married an Ann Billington, their son Edward being baptised in the same chapel in Oct 1786. Peter was also godfather to James' son James born in Dec 1786 - there must be a relationship here. Ann Billington could be a daughter of Edward and Ellen. The only records so far found give her mother as 'Ellin' and she was baptised at St John's Broughton on 19 Jun 1768, the year after the Return of Papists so of course would not be listed there. If Edward died just before Ann was born it might just explain the situation. Otherwise she was perhaps his niece. John Billington b. Catforth chr. 15 Oct 1785 sps. John Etherington, Anne Threlfall d. 10 Aug 1858 in Myerscough, m. Agnes Blacow of Thornton on 8 Nov 1817 at St Anne's Woodplumpton bur. 15 Aug 1858 at St Mary's Newhouse. Hodskinson, Hodgkinson, Hodkinson etc are all variants of the same name. sp= sponsor, i.e. godparent; these baptisms were in Latin so the Latin form of the name was the one used. Many sponsors were family but only those of the main line are included here..
All marriages, by law, had to be at a parish church (CofE), here usually St Anne's, Woodplumpton. Records of additional (Catholic but not 'legal') marriages can often be found. It is worth noting that Peter Rushton (whose wife was the unidentified Ann Billington of Lea mentioned earlier) appears for the 2nd time as a godparent and that James senr had been godparent two months earlier to one of the Rushton children.. Richard's baptism as St Anne's does cast considerable doubt on whether he belongs to this family though the record of his receiving the last rites and of his burial as 'paterfamilias de Plumpton' which gives him as aged 40, appears to confirm his baptism, which does not appear elsewhere. He was certainly a Catholic at the birth of his children in Lea..
Margaret Billington, chr. 15 Jun 1831 at St Mary's, Newhouse, a servant at Clifton in 1851 on farm of Henry Porter, farmer? James was given as a handloom weaver on the 1851 census. In 1861 he was a thatcher and then, at the age of 81 and 'retired' he was still working as an agricultural labourer. Anne (Nancy) had died in 1887 at the age of 86 but James is listed, now aged 91 on the 1891 census, living 'on his own means' at 8 Cottam Lane. He died the following year aged 92 . Alice is recorded as baptised at St John's Broughton as 'daughter of Nancy Brown'. It looks as though Anne Brown was usually referred to as Nancy as she was entered under this name on her marriage record as well. James and Nancy may have had a Catholic marriage - records were not always made and none can be found for Cottam at this date. Such a marriage would not be regarded as legal at the time. Alice married Thomas Thompson (b. 18, chr. 19th Sep 1811 at Salwick) and they had a son James aged 16, a labourer like his father, living at home in 1881 at 11 Herbert St in Ashton, Preston. His father was then 67 and his mother 57 so he was probably the youngest of a number of children. Thomas, now 77, is the head at 8 Cottam Road in 1891 and James Billington is entered as 'father-in-law'. The exact location of no. 8 Cottam Road is in some doubt. Go to Cottam details to explore this further. There is a quite close match of this Billington family on the 1851 Census giving James as a handloom weaver but Ann is said to be 41 which is ten years out as she was born in 1801. Betty at 12, also a handloom weaver and Mary aged 7 both match well enough but there is an Edward aged 3. It is possible that the older Edward died and another boy born about 1848 was also called Edward. There is also no sign of Jane, too young yet to be at work. For the moment the identity of this 'other' family on the 1851 Census remains a mystery. Edward and Alice Battersby (b. Lea 1826) had 8 children, Alice 1850 in Lea, James 1853 in Preston, Ann 1857 and Ellen 1859 in Ashton, Margaret 1861 (d. bef 1866) and Jane 1864 in Preston, another Margaret 1866 and Elizabeth 1868 in Preston, the dates being taken from the 1881 census. 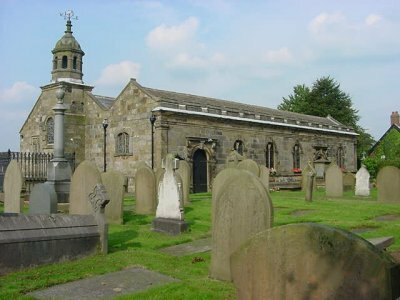 They married on 23 Sep 1850 at the parish church of St John's in Preston. It would be interesting to find any Catholic records for this family. Possible places (earliest marriages=M, baptisms=C, in brackets) are St Augustine's (C1840,M1841), St Ignatius' (C1836,M1837) and St Mary's, transferred later to St Wilfred's (C1768, M1769), where there could be a 2nd marriage record (not unusual) and baptisms of the children. In 1881 and perhaps from much earlier they were living at 12 Tuson St, across the railway but only 'a stone's throw' from St Walburge's. St Walburge's, begun in 1846 and opened in 1854 (but without the famous tower which was added some ten years later) seated 2000 though the congregation probably numbered many more than this, serving somewhere near 50% of the local population. The school opened at about that time is now used as the Talbot Library, serving the whole diocese of Lancaster. Elizabeth, the 3rd child, must be 'Cissie Travis' who with her younger sister Annie was running the tobacconist's shop at 162 Friargate, Preston in 1940. Cissie died in Preston at the age of 93 or more. This is not yet a positive identification as it was thought 'our' Cissie was born in 1894. If so, she must surely still belong to the same family, which would mean the earlier Elizabeth had died and a 4th or later child was given the same name. This remains to be checked. James was a general provision merchant, listed at various times as butcher, baker and grocer. Like most such houses in the middle of towns no.23 Fylde Road was occupied by several other people as well. In 1871 they had a servant Ann Glover aged 15 and lodgers Sarah Coupe, 60, dressmaker from Golborne and her daughter Lucy Ellery aged 16, born in Preston. These houses are mostly gone, replaced by garages and offices opposite the main university buildings around St Peter's which has been transformed into the university Arts Centre, but a block or two remain in the streets behind, between Fylde Rd and the site of the Bridge Inn. It is obvious how crowded this area was from the 1881 Census where large numbers of people are recorded as living in the cellars. This must have been very damp, dark and unpleasant as well as being very noisy. Just over the canal were the railway goods yards, the railway line to Longridge going underground here. All day long the roads would have been feverishly busy, with the continual clop of horses' hooves and the wooden wheels of the large heavy wagons rattling over the cobbles. Margaret died in the Sep Q 1878 and James went with his children to live at 41 Upper Hill St, Toxteth Park, Liverpool where he worked, oddly compared to his previous occupation, as a compositor. In the next few years he seems to have remarried, presumably to an Annie Slee as he is listed with a stepdaughter of that surname, also named Ann in the 1891 census, living at 14 Olive St in Liverpool. Annie was born in India and her daughter Ann in Devon. James had changed his job yet again, this time being a corn warehouseman. He died in the Jun Q 1900 aged 71. Jane lived for many years before her marriage at the Bridge Inn at 13 Maudland Road, working as a general domestic servant. This inn, run by the Noble family, was alongside the bridge over the canal in an area of what is now almost entirely university campus. By 1881 the daughter, Mary Ann Noble had taken over. The inn was demolished in the 1960s and replaced by a small car park and garden. By 1871 Thomas Lupton, now a widower, was living with his brother Richard on Ladywell St, only a short walk along the canal. Both brothers were working as coal carters. There were five coal merchants on that very short street, the canal basin with its coal barges taking up much of one side. How good that pint at the Bridge Inn would have tasted, washing out the coal dust and the tiredness of a day that would have been about twelve or more hours long. In 1875 when their first child, Thomas (2) was born they were living on Fylde Rd. Although no house number is given on the certificate they were probably lodging with Jane's brother James at no.23. All three Lupton children were born in Preston and christened at St Walburge's but by 1881 they had moved to Fleetwood. Mary married John Gornall, farmer of 16 acres, Burys Farm, Alston, Lancs. This farm was near the river, between Preston and Longridge. Their children were presumably born here but John and Mary later moved and were probably living in Ashton when they died. They are both buried at Cottam, against the hedge (out of view) on the right of the photo above. Their family includes Walmsleys of Ashton. Many baptisms and marriages of Catholics took place in the parish church till the end of the 18th century because of the laws against the practice of their religion and the difficulties encountered by priests. Most services took place in 'domestic' chapels - in large private houses or in remote farmhouses - where they could operate as discreetly as possible to avoid severe penalties. For safety they referred to going to Mass as 'going to prayers' and kept lookouts for fear of poursuivants. During the earlier penal times the priest was liable to execution (hanging, drawing and quartering) and harbouring a priest put many people in prison for years if not the same fate as the priest. Catholics were unable to open schools or seminaries in England so established them abroad and sent a constant stream of boys to study in Douai in France, Spain and Italy to return as priests, in disguise and often to die on the scaffold. Many houses had cunning hiding places concealed in walls and chimneys where the priest could if necessary stay for days. By the 18th century although it was possible to go more openly to 'prayers', the draconian penal laws now being ignored rather than repealed, there was inevitably a shortage of priests. At first they had to cover huge areas on horseback, perhaps keeping small notebooks in their pockets to record events but not regarding it as a positive 'duty'. By the end of the century it became possible to open chapels in barns or in buildings that resembled barns - they must not have spires or towers or look like churches - though they sometimes ran the risk of being burnt down by furious 'anti-popery' mobs as at Cottam during the Gordon riots in the 1780s. Hardwick's Marriage Act of 1754 was designed to prevent clandestine marriages which had in numbers alone become a huge problem. According to the law everyone - the only exceptions being Quakers and Jews - had to marry in the parish church (Church of England), Otherwise the marriage was not recognised and the children were considered illegitimate and could not inherit property. Two marriage records can often therefore be found for Catholics, on the same or subsequent days and there would be many more instances had more Catholic records survived or been kept. At this stage more permanent records were being made but there are frequent gaps if the priest was ill as happened at St Andrew's Cottam for six years between about 1806 and 1812. There doesn't appear to have been a system as in the parish churches which appointed clerks for such duties. The priest himself wrote everything down, usually in Latin. Names of course are in Latin and it is often difficult to tell what someone was actually called. Was it Maria or Mary, Helen or Ellen, Aloysia or Alice etc? It's probably wise to keep to the name used in the record but in the case of 'Helen' the name used was much more likely to be 'Ellen' - often written as 'Ellin' in the parish records. There was also a devotional practice particularly among the gentry but not confined to them, of giving many daughters the additional name of Mary. . This causes frequent problems where it came first. In Burke's Peerage and his Landed Gentry, apart from the failure to record birth dates for girls - only a favourable marriage is considered of any importance for a girl - the second name is often not recorded at all even though it would be the one actually used, inevitably leading to much confusion.